Safety is our passion. At Rocha Transportation “we walk the talk” when it comes to safety. We have 3 national safety awards and 4 state safety awards to prove it. It could not have been done without our great drivers and support staff. Their attention to detail and outstanding customer service is the foundation of Rocha Transportation. Operating safely is an absolute must. 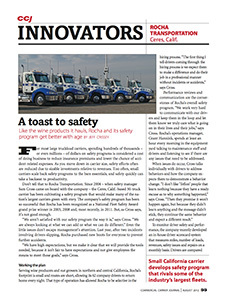 "Ceres, California-based 50-truck carrier has been cultivating a safety program that would make many of the nation’s largest carriers green with envy. The company’s safety program has been so successful that Rocha has been recognized as a National Fleet Safety Award grand prize winner in 2005, 2008 and, most recently, in 2011."